Tumors from people with Lynch Syndrome are likely to demonstrate loss of mismatch repair protein expression. 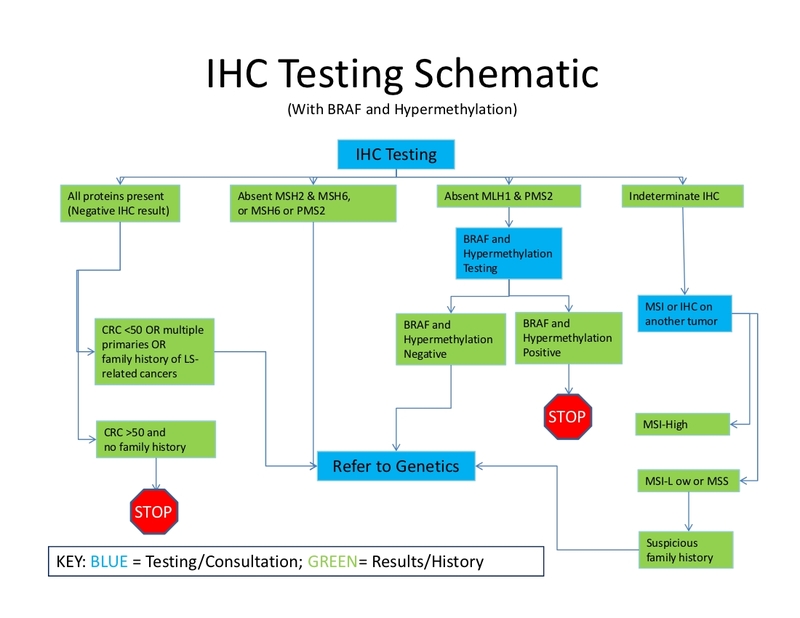 Immunohistochemistry (IHC) testing can be performed on tumor tissue to analyze mismatch repair protein function. The pattern of loss observed can provide information about which gene is not functioning properly. 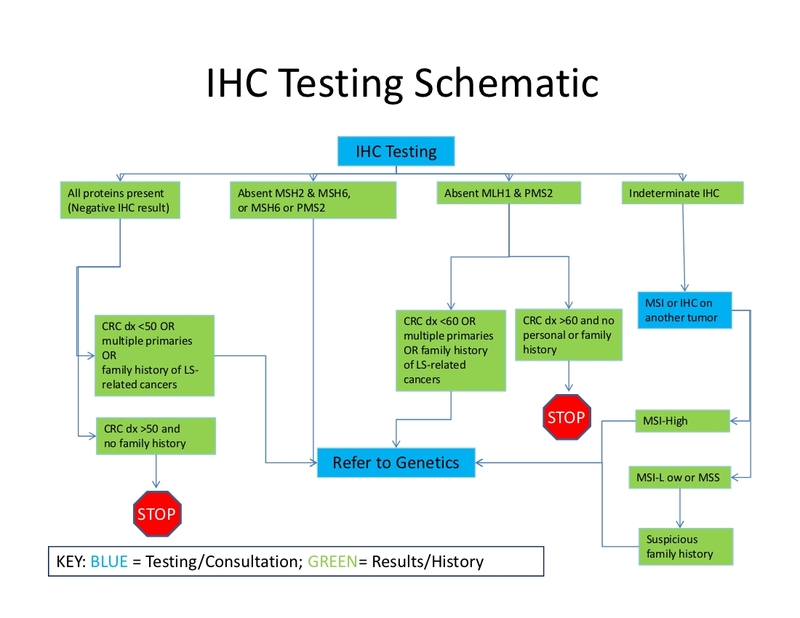 As a result, IHC can be helpful both in providing information about the likelihood of Lynch Syndrome and in directing testing for a germline mutation to a specific gene. Heterodimer pairings of mismatch repair proteins hold the key to interpreting the results from IHC testing. MLH1 and PMS2 form a heterodimer. MLH1 forms heterodimers with other mismatch repair proteins as well, but PMS2 only binds with MLH1. 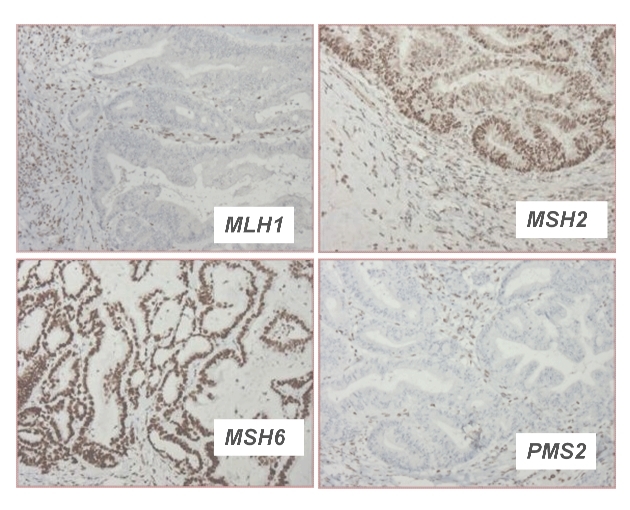 As a result, loss of MLH1 function will automatically lead to loss of PMS2 staining because it doesn’t have its binding partner. 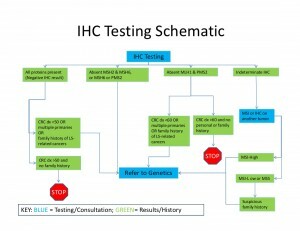 The reverse is not true, however, because MLH1 can still bind with one of its other partners. MSH2 and MSH6 form another heterodimer. Like MLH1, MSH2 sometimes forms a heterodimer with other mismatch repair proteins. Like PMS2, MSH6 only binds with MSH2. 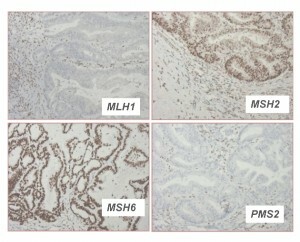 Loss of MSH2 function will therefore automatically lead to loss of MSH6 staining, but not vice versa. 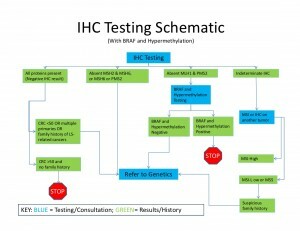 Unfortunately, interpreting IHC results is not always this straightforward; see the common dilemmas section for more information on difficult situations.